It was an up and down night. The heat race was good, I holeshot that one and won, but the main event was a tough one. I had a bad start, but I made a charge and worked my way up and made some good passes. I got into fourth and was able to catch Eli [Tomac] but ran out of time. In the grand scheme of things it was still good. I wanted to be on the podium and up in the battle tonight but just didn’t get a great start. I hurt myself there but like I said, the riding was there and that’s a good thing. I’m definitely fired up for Houston. You came up pretty hard on Eli there at the end. Obviously you were going hard the whole race, but when you saw you were creeping up on him did you push harder? At the beginning of the race I was battling and making a lot of passes and wasn’t able to find clear track. When I was behind Cole [Seely] we had a little battle that held me up a little bit, but around halfway I put my head down and got in some clear laps. I was catching Eli a little bit, and at the end I felt like I found a little bit more. Whether it was lines or finally just finally finding a good flow, it was good to catch him. Obviously I wanted to get a pass in there but was never close enough. On the last lap I felt like I put in a good charge and finished right there, but I just needed a little more time I guess. That or I should have gotten going sooner. Talk about the whoops a little bit. They were huge in qualifying but they got knocked down just a little bit. They still looked like they were pretty tough in the main. Yeah, they were. I don’t think they really knocked them down, I think they just worked on them. I think this morning they were really hard packed, and when they worked on them it allowed them to get a little softer, which in my opinion, almost made them worse because they broke down more. They were tough. We haven’t had a long set like that in a long time. I was trying everything. I had a good jumping line and felt okay skimming, but they were just tough. It was one of those things. You had to find something you could do for 27 laps. With the series in the homestretch and you holding the points lead, is there a temptation to ride conservatively at all? No. With the bad start I had tonight I didn’t have a choice but to move forward. It’s still close. 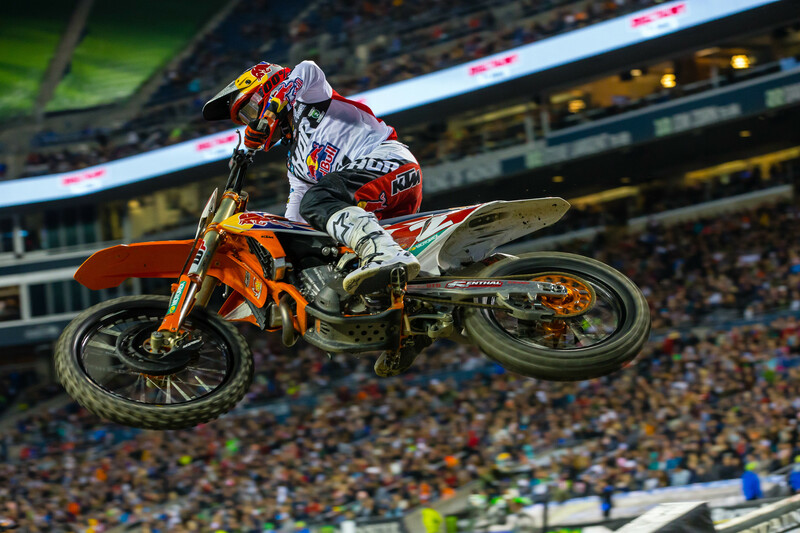 I don’t know what they’re going to do with Marv [Musquin] jumping on the medical flag, but still, he’s made up two good wins the past two weekends. My starts have hindered me the last two weekends from getting better results, but that’s okay. I’ll work on it and the Triple Crown is something that’s exciting and different and Houston is a cool venue. I just have to keep getting better, and unless you’re winning every race there’s always room for improvement. I don’t think you can be conservative until maybe the last round. What are you going to do during the week? Business as usual or will it be something different? It might be a little different with the three main events coming up. But I’ll go back to Florida with Aldon [Baker] and ride with the guys. I’ll work on some areas I need to improve on. The Triple Crown, I like them. They’re fun and different. You have to have good speed, and good fitness for the second and third ones. It’s exciting having three opportunities to race against the best. Marvin will be penalized points and purse equal to two positions in the final results, plus two additional points. The reason that’s important, the way it’s worded, is that he got first. The difference between first and third is five points. If he ended up seventh the difference would be only two points. But with a first place finish he loses seven points total. He’ll also be provided with a purse for third place, instead of for first. Is this something you investigated on your own, or was there a complaint from any specific team? Usually when something like this everybody sees it and we’ll be alerted through either phones, texts, or a team manager will come over and ask if we saw something. In this case there was no protest. It was an action we did ourselves. Did Marvin disagree with the ruling at all or was he in agreement? No, he knew what he did. He was probably a little confused on the penalty because his teammate, Ryan Dungey, did something similar back in the day (in 2016). But the rules changed since that happened and we explained the new rule to him. Unfortunately Marvin [Musquin] did jump. He wasn’t going fast, he did slow down, he saw the yellow flags, and I think he may have missed the red cross but on the video it’s there. He gets to keep the win but the points, he takes a seven-point deduction in the championship. That’s how the rule is written and that’s what we have to live by. It’s fair for everybody. It’s tough for the team to take it, especially for him in his position, he’s close to the championship lead, but it’s the rule. The rule is the rule. Former pro Jason Thomas previews the 13th round and gives his predictions for Houston.